I had the opportunity to try out the laundry powder from Molly's Suds. What a great product! It comes in a bag with a scoop and washes 128 loads. It is ultra concentrated and you only use 1 tablespoon per load! You add it directly to your washers tub even for high efficiency and front loading machines. This laundry powder is perfume and dye free. No SLS/SLES, no phosphates, no petrochemicals, no formaldehyde, no parabens, no 1,4 dioxane, no EDTA, no Diethanolamines, no synthetic surfactants, no PEG. Safe for high efficiency machines. Biodegradable. Certified Vegan and Cruelty Free. Human and Pet Safe. Great for those with extremely sensitive skin and cloth diapers as well. If you are at all conscience about what you put on your skin- remember laundry detergent is very toxic to humans and our earth. Our Laundry Powder is gentle to both you and the planet. Ingredients: Proprietary blend of sodium carbonate from the Green River Basin in Wyoming, sodium bicarbonate, epsom salt and sea salt. While there are no perfumes, which are neurotoxic and petroleum based, there is a very minimal amount of organic peppermint essential oil. I also purchased the dryer balls. They are felted from 100% wool and we can safely say, “no chemicals, no dyes…just natural, humanely raised wool”. Gently sheared from Navajo-Churro Sheep on a few farms in North Carolina! Put all 3 of them in your dryer with your laundry…they reduce your drying time 30-50%, soften, and reduce static cling. No more need for chemical laden dryer sheets or commercial softeners. I can tell a difference in using these while drying our clothes, they do dry faster and I don't have to spend all the money on the dryer sheets. Molly's Suds is a Mom Owned Company!! To purchase any of these fabulous products go to Molly's Suds ~ Shipping is a flat rate of $5 ~ How great it that!! 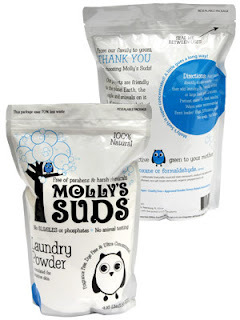 A big thanks to Monica at Molly's Suds for offering to GIVEAWAY a bag of laundry powder to one of Mommy's Moments readers! Check back soon we will also be doing a review & giveaway of Molly's Suds Dog Wash! Enter the Rafflecopter below ... Good Luck! It is a proprietary blended sodium base that is free of preservatives and surfactants. It works beautifully in hard and soft water and fabulous on stains! I did not know that before you walk out of the door in the morning it is said your skin has come into contact with over 150 chemicals. Wow! I learned that Molly's Suds Laundry Powder is non-toxic and safe for use on cloth diapers. 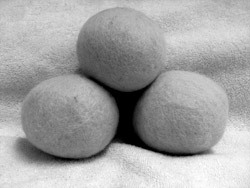 I learned that the products are completely natural and the wool balls cut down the time of the drying. I did not know that, how wonderful ! Always add Molly's Suds DIRECTLY to your washers tub. I learned that before I walk out of the door in the morning it is said your skin has come into contact with over 150 chemicals. YIKES! From the experience as a mother taking care of her family, there are tons of tips to gather from the wonderful ladies out there. Molly's suds is something remarkable for making a great impression. I learned that the detergent is dye-free. Molly's Suds products have been tested on their friends and families.. and dogs too! Molly sud's was named after her daughter. Always add Molly's Suds DIRECTLY to your washers tub so that it dissolves properly...especially important in HE machines. I learned there is NO Animal Testing! They even have Dog Wash! Oh my! I learned about precious Molly and how this product carries the wee one's name and footprints. This is really good stuff!Dye free and made with pure elements of the earth. I learned they make Dog Wash! You can get a free sample! I love that shipping is a flat $5! I learned that the laundry powder is free of perfumes & dyes! I learned they have an all sport laundry soap too, and you can even use it to wipe down sports equipment. Molly's Suds products have been tested on friends and family, humans and dogs big and small. Cloth diaper brands from prefolds to Bum Genius. Hard and soft water and in many different washers from ancient to top of the line high efficiency (HE). only 1 TBSP per load will do the trick. WOW! Whats wrong with the following statement for a web search engine filter?